This is the MMA Scheme that I came up with, can be used for all types of anaesthesia, GA, RA or GARA. It Is Common Sense That We Would Avoid Lignocaine Infusion if you have already used LA unto its Safe Limits. Also, You May Not Need To Use Opioids Intra-Op if you have Used SAB or Epidural or Even for that matter good working Nerve Blocks But Rest of the components of MMA can be used in these cases. MMA is not just for GA Patients, it should be applied to all types of Anaesthesia. It is vital to realize that blocking the neuronal pathway during surgery with local anaesthetics does not decrease the HUMERAL BIOCHEMICAL RESPONSES that occur during surgery which have to be inhibited by administering systemic pharmacological therapy. MMA employs the theory that agents with different mechanisms of analgesia that may have synergistic effects in preventing or treating acute pain when used in combination. These regimens must be tailored to individual patients, keeping in mind the procedure being performed, side effects of individual medications and patients’ pre-existing medical conditions. Some of the doses not mentioned in the image. LIGNOCAINE INFUSION: Most start with a bolus of 1.5mg/kg over 30 mins and then continue with a infusion of 2mg/kg/hr which is reduced to approximately 1.0 -1.5mg/kg/hr in the post-op period. MAG SULPHATE: Magnesium seems to exert its analgesic mechanism via inhibition of calcium influx, antagonism of NMDA receptors and prevention of enhanced ligand-induced NMDA signaling in a state of hypo-magnesemia. In addition magnesium may attenuate central sensitization after peripheral tissue injury or inflammation because of dorsal horn NMDA receptors. The common mistake made by most is that they used too low a dose for analgesia. The dose is 40- 50mg/kg, so in a 70kg patient, it is 2.5 - 3.5 gms i.e 10 - 14 mmols. I tend to use anywhere from 12 - 20 mmols in my cases. 1gm or 2mls of Magnesium (500mg/ml) = 4 mmols. KETAMINE: Bolus of 0.5mg/kg followed by 10μg/kg/min Infusion, higher infusion doses can be used in chronic pain or in opioid dependent patients. In MICROWAVE WARMING, the radio waves penetrate the fluid and excite WATER MOLECULES much more evenly. No heat has to migrate toward the interior by conduction. There is heating is evenly distributed because all the molecules are excited together. So in brief, the whole heating process with MICROWAVE is different because you are "exciting atoms" rather than "conducting heat." 1. DOES THE MICROWAVE WARMING AFFECT THE COVERING (PLASTIC)? Can components from the plastic leach out into the fluids? ANS is BIG NO! Why? 1. The duration for which the microwave is used for heating the fluids unlike COOKING FOOD in plastic containers is TOO SHORT. 2. The potential for small amounts of plasticizers to migrate into the fluids depends on the ratio of plastic surface area to fluids, how long the container is likely to be in the microwave and how hot the fluids can be expected to get during microwaving. 2. IS THERE ANY CHANGES IN THE FLUIDS THAT CAN BE HARMFUL? In this publication the authors investigated microwave heating of PD fluids in an effort to find a technique, which would allow the nursing staff and patients to choose the precise strength of solution they would use at the time of exchange. B. They did not detect any alterations in pH or biochemistry of the fluid. 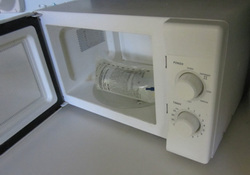 The authors concluded that heating the fluid in a microwave oven in the hospital environment represents a rapid, cheap and safe technique during the training period of patients on CAPD or IPD. PD solutions bags containing one litre and two litres of fluid were heated for periods starting from 30 seconds to 5.0 minutes by increments of 30 seconds. Half litre bags were heated for a time interval increased by increments of 30 seconds and, it was not possible to heat a half-litre bag longer than three minutes because the bags tended to rupture at temperatures over 70°C. kept in a hot-water bath at a temperature of 44 oC for two hours . Dialysis fluid from one bag at room temperature and from four bags heated to 40°C by the microwave oven, was analysed for degradation of dextrose using the limit test in the British Pharmacopoeia 1980 i.e. 5-hydroxy- methylfurfural and related substances.The pH and dextrose content of the fluid was measured before and after heating the fluid. In this article the authors evaluated the efficacy and affected variables of the microwave oven in warming crystalloid fluids and to determine the appropriate formula for calculating the warming duration. The important variables influencing the operation of the microwave oven include the difference between the crystalloid fluid and room temperature, the microwave oven's capability, variations in microwave irradiation, and fluid shaking. The appropriate formula for calculating warming duration is: Duration (sec) = Volume (cc) x 4.2j.g(-1).K(-1) x Raised temperature DeltaT (K) x 1.1 (Adjusted power) / Mivcwrowave power (W). The microwave oven is a safe and practical method for warming crystalloid fluids. Anshus JS, Endahl GL, Mottley JL. Am J Emerg Med. 1985 Jul;3(4):316-9. Microwave heating of intravenous (IV) fluids is a viable alternative to heating by conventional means, such as by blood warmer(s) or an on-site warming oven, for administration to hypothermic patients and trauma victims. Three 1-l bags each of lactated Ringer's solution, normal saline solution, 1/2 normal saline solution, and 5% dextrose in water were packaged in parenteral containers and heated in a microwave oven from room temperature (21 degrees C) to 40-42 degrees C in 3 minutes. Little difference between temperatures of the four solutions was detected at each of five intervals up to two hours after heating for 3 minutes. Samples were taken before and after heating to assess any potential alterations in sodium, potassium, chloride, calcium, glucose, and lactate levels; differences were within the range of variation of the methods used. Though the plasticizer in the polyvinyl chloride containers is stable to microwave heating, data on other components is incomplete. Ann Emerg Med. 1985 Sep;14(9):876-9. A rapid method of warming IV fluids is the microwave oven. Heating time for liter bags of crystalloid to 39 C was determined to be two minutes at high power, 600 W. Fresh frozen plasma was thawed with five 30-second exposures to microwave radiation. Microwave warming of packed red blood cells (PRBC), 4 C to 37 C, resulted in a 17-fold increase in plasma hemoglobin over that of water bath controls, (P greater than .01). Heating on a warm cycle to room temperature, 21 C, caused an average 26% increase in plasma hemoglobin. Therefore, we do not advocate microwave warming of PRBC because of the possible danger of local overheating, which causes hemolysis. We warm PRBC secondarily by diluting with microwave-warmed, calcium-free crystalloid. 5. EXPERIMENTAL STUDY OF ADEQUATE MICROWAVE WARMING OF CRYSTALLOIDS AND DERIVATION OF AN EQUATION FOR CALCULATING HEATING PARAMETERS; TN Meyer et al. This study experimentally evaluated the heating of saline solution (sodium chloride 0.9%) at different initial temperatures to derive an equation to calculate heating parameters as well as the temperature decrease in saline solutions after heating. The initial temperature of intravenous pouches containing saline solution (500 and 1,000 mL) was adjusted to 15°C, 20°C, or 25°C. The 500 and 1,000 mL pouches were then warmed in a microwave (900 W) for 60 and 120 seconds, respectively. The temperature of the saline solution was measured during heating and immediately and 30 minutes after heating. An equation was derived from the results. Warming the 500 and 1,000 mL pouches for 60 and 120 seconds, respectively, at 900 W increased the temperature of these pouches by 20°C. The derived equation was as follows: final temperature = initial temperature + [0.165 × time (s)/volume (L)]. No significant differences were found between the internal and external temperatures of the pouches after heating. There are more studies but these are enough to prove the point. 1. Crystalloids can be warmed safely using microwaves. It is important to know the power of the microwave before using it or this purpose. A Litre bag of crystalloids can be heated to 39oC within 2 mins using a 600W Microwave. With 900W it takes 1 min to heat 500mls Bag and 2 mins to heat 1000ml bag from room temp of 20oC to 40oC. 2. For 900 W Microwave, final temperature = initial temperature + [0.165 × time (s)/volume (L)]. 3. Blood should not be warmed using microwave, local heating can cause haemolysis. Happy holi, the festival of colours to all the members. Hope this festival of holi brings victory over ignorance within all of us and may life for you be as colourful as the colours of Holi. Last week we celebrated International Women’s Day and we wish all the lady members on this group a very happy and wonderful future. Congratulations to Vineet Gupta for winning the “employee of the year” award. There are too many posts to review, it is running into more than 10 pages of my word document, so I will be posting it in stages. The answer is not necessarily. Lap cholecystectomy is not associated with significant blood loss hence using TA in these cases is not justified. The evidence that TA reduces the need for blood transfusion is strong but the safety of routine use of TA in surgical patients remains uncertain. A modest increase in the risk of thromboembolic effects could outweigh the benefits of reduced blood use eventhough not proven beyond doubt in most of the recent studies. So use it where there is risk of significant blood loss. Also do not forget to use thromboprophylaxis both chemical and mechanical in these cases. The decision to cancel or proceed should be made on individual basis by considering the presence of identified risk factors and the anaesthetist’s own comfort and experience with anaesthetizing children with URTI. You can proceed with the anaesthetic if the child appears healthy with no symptoms other than clear rhinorrhea, will not require an ETT, and will not undergo surgery involving the airway. Elective case should be postponed if the child has purulent nasal discharge, productive cough and/or fever, or there are clinical signs suggesting lower respiratory tract involvement such as desaturation or wheeze. In major cases, ultimately the decision to proceed or postpone surgery in a child with URTI rests on the anaesthetist after consultation with surgeon and parents who should be fully informed of the risks. If you are thinking of GA for such cases then, barbiturates are the classic example of drugs that are dangerous in patients with porphyria. Propofol is the best choice at present for intravenous induction, although there is some doubt about its use as an infusion. From long use, halothane has proven safe, and isoflurane is probably so; enflurane should be avoided, and information on sevoflurane and desflurane is insufficient. Opioids, such as morphine and fentanyl, are safe, whereas there is not sufficient data on some other analgesics to be sure of their position. All muscle relaxants are probably safe, although, again, there are not enough data about most to be completely sure; on the other hand, atropine and neostigmine are known to be safe. Drugs that are unsafe or probably so include barbiturates, etomidate, enflurane, alcuronium, mepivacaine, pentazocine, some benzodiazepines (temazepam is safe; others are less certain), calcium channel blockers, and aminophylline. In the event of an acute crisis, it is vital to assess muscle strength and bulbar function because severe disease may cause respiratory failure and risk of aspiration. Postoperative ventilation may be necessary. All possible precipitants must be withdrawn and adequate hydration must be ensured. Haematin is the only specific treatment that probably has an effect by supplementing the free haem pool and suppressing ALA synthetase. However, it may cause renal failure, coagulopathy, and thrombophlebitis. Haem arginate is a suitable alternative that is devoid of the side effects associated with haematin. β-blockers have a dual role, both in controlling tachycardia and in decreasing ALA synthase activity. In the ICU setting, it is recommended that high carbohydrate intake be instituted because carbohydrate loading can suppress porphyrin synthesis. Screening of families to identify presymptomatic carriers is crucial to decrease the risk of overt acute porphyrias through counseling on avoidance of potential precipitants. This case was successfully done under SAB, the safest option in such cases but it is important to remember that stress itself can precipitate porphyric crisis. There are no evidence-based guidelines that address management of thrombolysis-associated ICH. This is likely because of the lack of published original research examining management. The American Heart Association (AHA) suggests empirical therapies to replace clotting factors and platelets but acknowledges the lack of evidence to support any specific therapy. In a study, it was found that nearly 40% of patients with follow-up CT scans showed evidence of ICH expansion and ongoing bleeding, suggests a potential window of opportunity for therapy. Reducing early hematoma expansion after ICH might improve clinical outcomes. Patients who are coagulopathic because of receipt of a thrombolytic agent may be more likely to receive clinical benefit from hemostatic therapy. The choice of hemostatic therapy remains controversial. Thrombolytic agents convert plasminogen to plasmin, which degrades fibrin at the site of thrombus formation. Antifibrinolytics such as aminocaproic acid or TA seem to be a logical antidote to fibrinolytic therapy and have been proposed as an aggressive measure for limiting intracranial bleeding BUT it is not recommended in the AHA guidelines because of the risk of inadvertent prothrombotic activity. In addition, if tPA induces systemic fibrinogenolysis, fibrinogen replacement in the form of fibrinogen concentrate, FFP or cryoprecipitate would be a logical choice for patients with low fibrinogen levels. Studies have found no cases in which patients developed fibrinogen levels of < 100 mg/dL, suggesting that currently used tPA dosing regimens are unlikely to induce hypofibrinogenemia, and any benefit of such therapy may be limited. Because clot lysis releases D-dimers, which can exert an antiplatelet effect by binding to the platelet fibrinogen receptor, there is a theoretical basis for infusion of platelets as a rescue therapy but again this hypothesis has not yet been tested. Finally, thrombolytic agents may affect a number of processes independent of their effects on clot disruption, including extracellular matrix degradation and cell signaling. Interventions aimed at reversing these noncoagulopathic effects may offer promising avenues of research. Post polio pts suffer small decrement in muscle strength per year and this can occur due to reactivation of the virus, late death of additional motor neurons or late denervation of previously reinnervated muscle fibres. There is no known effect of post-polio syndrome on the pregnancy as such. A. WHAT DO WE LOOK FOR SPECIFICALLY IN THESE CASES? The patients can present with fatigue, myalgia, fasiculations, weakness of skeletal and bulbar muscles, new onset respiratory difficulties and even sleep apnoea. Paralysis cab affect respiratory status of the mother. Due to pelvic asymmetry and inability to push effectively during labour maeans higher caesarean deliveries in this group. In general; laryngeal dysfunction, unilateral/ bilateral vocal cord involvement can occur and there is increased risk of POSTANAESTHETIC APNOEA. NMDR there is increased sensitivity so use smaller doses and monitor NMJ. Keep patient in HDU post GA for observation. The answer to any such problem is MULTI-MODEL ANALGESIA. As far as RA techniques are concerned, the best option for these cases is still Inter-scalene brachial plexus block (ISBPB) with/ without Suprascapular nerve block. In patients who cannot have ISBPB for whatever reason or pain once this block wears off, then Suprascapular n block alone can give very good analgesia in these cases. For the best results, Inter-scalene catheters can be used if facilities are available to look after them in the psot-op period. A very sad complication but if recognized early then progress to amputation can be easily avoided. The management of such cases is no different from intra-arterial injection of thiopentone as the mechanism of injury is similar. Simple measures could have saved the limb. 1. Consider anticoagulation with intravenous heparin infusion. 3. Consider sympatholysis with a stellate ganglion block or single shot/ continuous supra-clavicular brachial plexus block (most anaesthetist should be able to do this). 4. Extremity should be elevated to decrease edema and reduce the risk of compartment syndrome. Vigilance, immediate recognition of the problem, discontinuation of the irritant, and rapid initiation of treatment offers the best chance of a good outcome. Elevated SGPT can happen with hypothyroidism though rare. Hypothyroidism can be cause of acquired vWF disease. When you talk about rare disease you are rarely correct. If course first thing first. Infection: nose is highly vascular an surgical site infection can cause such a prolonged small bleeding. That leaves us with bleeding disorders which needs expensive diagnostic test. I would pursue testing if the family history is strong . I suspect that might be the case here. Mean while assuming vWF disease it spent hurt to give some desmopressin. I will also consider topical Tranexamic acid. I mean nose packs with gauze soaked in 500 mg to a Gm of tranexamic acid. I have tried that in nose bleeds from heparin in cath lab and had some success. Hope this child does not have a hemophilia. If it turns true then I agree with you on cryo or factor Concentrate if available. If it is available it is worth trying topical thrombin or cryoglue. I assume surgeon has already tried cauterization. 1. Regional analgesic techniques should be considered to reduce or eliminate the requirement for systemic opioids in patients at increased peri- operative risk from OSA syndrome. 2. If neuraxial analgesia is planned, the potential benefits (improved analgesia, decreased need for systemic opioids) and risks (respiratory depression from rostral spread) of using an opioid or opioid– local anesthetic mixture must be considered and compared with the risks and benefits of using local anesthetic alone. 3. If PCA opioids are used, continuous background infusions should be used with extreme caution or avoided entirely. 4. Non-steroidal anti-inflammatory drugs and other possible modalities should be considered appropriate to reduce opioid requirements (multimodal approaches). Now that you have got the answer to the SUNDAY QUIZ by Ishani, here we go with the next Sunday special, the weekly review. Have come across many cases posted by the member where they never progressed beyond few “likes”. It is the responsibility of the member of the group posting the case to take it forward till the conclusion and if possible summarise it in the end. You need to keep “poking” as sometimes your post might be lost in other discussions that might be of lot more interest. Many a time we may not have answers to your problems but discussions help to think and plan-out care when similar situations arise in the future. For e.g. Laxmi Pathak posted about a young patient who arrested 7 times and could not be revived. We could not give a definitive answer why that happened as there were no investigations that could point to the cause. Shared a case of an arrow injury to the neck. Arrow was in the s/c plane at the back of the neck. The patient was unable to lie down. He reassured the patient and give sedation. Did some modification on the table with pillows and head ring. Got the patient to semi-lateral position and gave GA with ETT, converted to prone position without much movements on neck. Thereafter the surgery was a cakewalk, simple removal of arrow. Shared a case of severe post-burns contractures (PBC) from two years ago. The airway was managed by intubation of the trachea through an ordinary LMA as they did not have access to fiber-optic intubation at that time. There are many techniques for securing the airway in such situations but most important is patient safety. Many would have preferred to give Ketamine and release the contracture under LA and then done the intubation but you should try the techniques that you are familiar with or have supervision from experienced persons while dealing with such airways. Wanted to know about use of Intra-osseous needles in adults esp for use in massive intra-partum or post-partum haemorrhage. The use of IO devices in adults has lagged behind the use in children due to the fact that the adult bone is lot harder to pierce unless you have special devices. In 2005 ACLS and AHA began advocating the use of IO devices for adults as an effective and equivalent alternative to intravenous access. This was probably because the IO route was thought to be more appropriate than an endotracheal tube for delivery of medications if no IV access was available. IO route provides a more predictable drug delivery and pharmacological effect than delivery via ETT. Devices like EZ-IO are drill based and allow Proximal or Distal tibia and Proximal humerus to be used for IO route. They come with colour coded, weight-based needle sets (PD, 3-39 kg; AD, >40 kg; LD, “excess tissue” over insertion site) that can be inserted using a battery operated power driver. Tranexamic acid significantly reduced the amount of blood loss during the LSCS, but it does not reduce the blood loss significantly after the caesarean section (not after 2 hrs as per some studies). Smaller studies have shown that there are no side effects or complication like thrombosis but this cannot be definitively proven. Patient in her early 30s with no co-morbidities posted for hydatid cyst of liver excision, management? The patient presented with mild right hypochodrial pain associated with loss of appetite and some loss of weight loss. The cyst was picked up during a routine USG of the abdomen that was got done by a GP. CT abdomen done, showed a huge hydatid cyst straddling across both lobes of the liver with clearly visible daughter cysts. She was put on 2 weeks therapy of Albendazole 400mg po bd. The idea was to kill as many scolices as possible and reduce the antigenicity? An IJV triple lumen and a thoracic epidural were inserted preop. Hydrocortisone 200mg was given at the time of induction. Induction of anaesthesia was with Propofol, fentanyl and atracurium. Upon opening the peritoneum the surgeon packed the area around the point where the cyst was to be opened with mops soaked with 3% saline (10 % saline is better), it is considered to be a sporicidal. Two suctions were kept ready. After thorough suctioning the daughter cysts were removed. 3% saline wash was given after which the wall was scraped off. The peri cyst was left intact. There wasn't much bleed though. Abdomen was closed with a tube drain insitu. Recovery was uneventfully. Post op a 3- cycle therapy of Albendazole was planned each of 3 weeks duration with a gap of 1 week. There is some chance of recurrence and this post op therapy reduce the chances. AMAN AGARWAL: PALAGIRISM OF A DIFFERENT KIND? Aman’s thesis was published in a journal without his name and his permission by his co guide and his junior. The chief editor Dr Khan who is a member of the group sorted the issue amicably. Gave spinal to a patient, 53 male, of pott's fracture. He was on prophylactic aspirin 75mg for IHD. His ECHO was normal with good exercise tolerance. The whole procedure was uneventful. Later after 6-7 hours of surgery, the patient showed all the drugs he was on. In addition to aspirin, he was on Atenolol, Depin, Atoravastatin and CLOPIDOGREL. He had not stopped Clopidogrel. There was no motor weakness or neuro deficit post-op even after >24 Hrs. How to manage such cases? This probably a case of individual variability in Clopidogrel effect? Recent studies indicate that the pharmacodynamic response to clopidogrel is variable, with 20-40% OF PATIENTS BEING CLASSIFIED AS NON-RESPONDERS, POOR-RESPONDERS OR RESISTANT TO CLOPIDOGREL BECAUSE of low inhibition of ADP-induced platelet aggregation or activation. There is no way this can be identified in the peri-op period. Platelet function analysers can be used to see effectiveness of platelet adhesiveness. The only thing that can be done is observe. Had a case of open appendicectomy ( 40yr/F). Done under SAB( Bupivacaine 0.5% 3.5 cc with 23G LP needle at L2-L3 ). All investigations were WNL. Difficult spinal ( 4-5 pricks). Post spinal patient had persistent motor blockade. The effect on one side was for more than 15 hours and the other side sensory and motor both the functions not regained at all. What would be the reason and how to manage? Patient was referred to higher centre where an MRI was done and it revealed disc herniation at L4-5 and L5-S1 level which was probably responsible for the persistent neurology. The patient was given high steroids and did gradually regain power. This is something that we might ignore in most patients. Many patients have back problems and disc herniation is not unusual. The question is should SAB be avoided in such cases. Disc herniation itself is not an C/I for SAB but such cases do make us think, SAB is not always the safest bet at times. A 60yr male patient with h/o CAD- 3 episodes of MI in the past 10yrs was put on antiplatelets which he discontinued 6 months ago. His blood investigations were normal, ECHO showed dilated cardiomyopathy with EF of 25% and global hypokinesia. His HR was 110 and BP was 120/70. He had distended abdomen because of intestinal obstruction, USG confirmed obstructed bowel loops in the colon, suggestive of Ca Colon. Listed for laparotomy, anaesthetic management? The case was done under GA and Thoracic epidural. Patient’s trachea could not be extubated on the table therefore kept on CPAP overnight and uneventfully extubated the next day. It is important that all aspects of care; induction, maintenance and post-op are carefully planned. Post-op analgesia is important and leaving the patient’s body to sort out fluid shifts without having to stress the respiratory system and oxygenation can be of benefit (patient left on CPAP overnight was a good idea). 65 yr male patient with HT, IHD and CRF posted for Kochs (TB) spine surgery. Patient is on HD twice weekly. Echo – EF of 35% , grade 1 diastolic dysfunction, global hypokinesia. Treatment history, on Imdur , carvedilol , amlodipine and clopidogrel-aspirin. Patient's creatinine is 6.8 , K+ 6.4. Last HD 3 days ago. How will you manage this case ? Patient had HD the day before surgery with this K+ came down to 4.7. Anaesthesia was induced with 50 mcg fentanyl, 70 mg propofol and trachea intubated with 30 mg atracurium. Surgery lasted for 6 hours. Blood loss was 1.3-1.5 litre. Replaced with 4 RCC, 4 FFP and 1.5 lit NS. Surprisingly blood loss was less than expected. Vitals well maintained through out and the trachea was extubated at the end of the procedure. Important thing in such cases is fluids and electrolytes. Uremia itself can lead to reduced platelet adhesiveness and increased bleeding despite adequate numbers. It is a common practice to stop Clopidogrel for 7-10 days and continue Aspirin till the day of surgery (in vascular cases both are continued). Despite this you often find surgeons complaining that the field is very oozy and if you can do something about it. So what can be done to stop this oozing? Three simple interventions that can be of help with out the need to use blood bank services. When a post part hemorrhage pt presents to you with Hb of 3Gm% and clinically correlating, will you extubate the patient after obs hysterectomy. Having replaced all the blood loss of around 2 litre and normal ABGs at the end ? Or its better to electively ventilate ? Most members agreed that the patient should be electively ventilated as it gives time for physiological parameters normalize. There was another group who though that since these are young patients, if the bloods (Hb and acid base status) and haemodynamics ( and temp ) are normal at the end of surgery, why not extubate the trachea. Whichever decision is taken, it better that the patient is monitored in at least level-2 bed. Massive blood transfusion is associated with unpredictable morbidities like TACO and TRALI and if identified earlier and managed appropriately, have good outcomes. 52 year old diabetic and hypertensive posted for FESS. Normally on insulin. Morning fasting FBS of 190 mg %. Creatinine of 1.2 increased to 1.4. Na+ was 153. Patient not on any diuretics and his Cl and K were normal. How to correct hypernatremia and should we proceed with the case? This was a case of acute hypernatraemia. The goal in such cases is to lower the serum sodium by 1 to 2 meq/L per hour and to restore normonatremia in less than 24 hours. Monitor the Na+ levels hourly till they are less than 145. The case was postponed and after about a litre of 5%DW + 12 units insulin, Na+ came down to 147 and the case was taken up. Same fluid regimen was continued intra-op. A patient in his late 50s was listed for carotid endartrectomy. Know case of IHD, had CABG 3 years ago. Known COPD and still smokes, was smelling of cigarettes on the morning of the surgery. Had a recent stroke (TIA) and on investigations found to have significant carotid artery disease. Usual anaesthetics, GA with cervical plexus block. Midway through the procedure, airway pressures started going up and ETCO2 started dropping. Muscle relaxation was adequate and he was on Sevo which was running at 1.0-1.2 MACs (age adjusted). How are we going to manage the bronchospasm? 2. Patient had IV Dexamethasone at Induction and 16 mmomls of MgSO4 was already running in anticipation as he was a known COPD patient. 3. Gave 2 shots of IV Salbutamol 500mcgs slowly and there was some improvement. We did give him 100mg of Hydrocortisone as well. 4. Got nebuliser set and attached it to the Insp Limb of the circle system with 5mg Salbutamol. With this his bronchospasm settled down within no time. As per the guidelines, nebulisation should be initiated ASAP along with other measures. You can also use special connectors to give puffs from Inhalers or the technique described in the discussion by Nebhu ( pictorial!). You can actually disconnect the ETCO2 monitoring line and use that to deliver the Puffs as well. Sudden swelling noted on the rt side at the site of CVC. Soft, no signs of hematoma . It was a 4 lumen catheter, checked for back flow, could draw blood from all the ports without resistance . No respiratory distress. Pt comfortable. This was a case of extravasation of fluids from a catheter that was considered to be well fixed. The catheters do move despite the appropriate fixation and it is a known fact that proximal lumens can move in and out. Check X-Rays in such cases can demonstrate the movement of the tip that can be compared with previous x-rays. A 65 yr old lady was admitted with # tronchanter right, with no comorbitites except hypothyroid. On irregular treatment with Thyroxine 50 mcg od. Her initial blood reports were normal. Except TSH of 60 and T3 , T4 of 4. Her Thyroxine Increased from 50 to 100 and then to 150mcg/day. Medicine consultant asked to go ahead with surgery on 9th day when her repeat values were TSH 40. FT3 0.7 and FT4 1.5. Her cardiac evaluation was done pre-op which was normal. She was planned for surgery under SAB. Intraopertive period of 1hr was managed with crystalloids and 1 unit blood. Pt was well till 5hrs post op. Then suddenly she had one seizure as reported by the nurse,was followed by bradycardia and asystole. She was shifted to the ICU and put on life support. But ultimately she did no make it. What went wrong? As far as anaesthesia is concerned there is nothing wrong with the management. The cause of seizure followed by bradycardia and asystole does point to thromboembolic event. Without post-mortems, it is difficult to get the exact diagnosis and we can only speculate what could have gone wrong. 76yr lady with ‪#‎NECK‬ OF femur posted for hemi arthroplasty, no comorbidities ECG shows T wave inversion in V5,6 . ECHO mild MVP, MR. BP 190/100. SAB With 1.8 ml of 0.5% bupivacaine heavy with 10 mcg of fentanyl given. After 75 mins when bone cement was applied pt desaturated, hypotension bradycardia , 40/ min. Inj atropine 0.6 mg given, Heart rate dropped further, made patient supine and Inj adrenaline 1 mg iv stat,100mg hydrocortisone and dexona 8 mg IV administered. 100% oxygen by mask. Rate picked up to 150/min , bp 178/110, SpO2 100%. Pt is responding to calls after resus. Bone cement implantation syndrome (BCIS)? Yes, this looked very much like BCIS and it is a diagnosis by exclusion mostly. The case was managed exactly as has been described in the literature. Steroids are not often mentioned but there is no harm in administrating them as one of the theories is of anaphylaxis to bone cement. SURAJIT GIRI: FEMORAL NERVE AND LATERAL FEMORAL CUTANEOUS NERVE BLOCK IN KID-PNS GUIDED, A video demonstration. HETAL: Multimodal modal analgesia in paediatric patients. PIYUSH: Patient ( a friend of Piyush) interview following hernia repair under IIN and IHN blocks. Patient satisfaction is very well demonstrated in this video. NEBHU MOHAMMED: PULMONARY VENOUS ISOLATION (PVI) for refractory AF. Nebhu has described the whole procedure in this thread including the anaesthesia management and complications. Mortada describes a technique he uses in these cases. 1. An infiltration catheter is inserted over the peritoneum and fixed. A bolus dose of 10 ml 0.75% lidocaine with adrenaline is given and a nice spread of LA above the peritoneum is observed and the surgeon then closes the muscles above the peritoneum. 3. A infusion of 0.75% lidocaine 3- 5 ml /hr is started using a connector with bacterial filter that is attached to a portable infusion pump. AASHISH JAIN: Checklist for thrombolytic therapy in acute STEMI and other important information. SENTHIL KUMAR MUTHU: ROBOTIC surgery is gaining popularity for major Urology, GI and Gynaecological procedures. Is the use justifiable? What are the anaesthetic implications? A nice discussion with contributions from Sugam, Nebhu, Anil, Jayanth and others. ASHWINI GHAROTE: Did an awake craniotomy on a 30yr old male for tumor just adjacent to motor cortex with dexmedetomedine and fentanyl infusions, with scalp blocks. Those of who missed it have a look at the image on the group. The question on the X-ray was, Can you guess the name of the surgical procedure? What is the technical name of this x-ray view? It was a cephalometric x-ray after a MMA (Maxillomandibular advancement surgery). Pre and Postoperative cephalometric x-rays are used to compare improvement in obstructed airway in a patient with sleep apnoea. This is the 2nd anniversary week of the group. On 7th Feb 2012 Dr Vivek Gupta messaged me to moderate this group which was called Indian Anaesthetist but on my suggestion he changed the group to “The Anaesthetist” on 21st Feb 2012. I thought I will give a surprise to everyone who enjoyed the weekly review, so here we go. 1st of all a very warm welcome to all the new members. Since the group has grown to more than 3000 members, I find it difficult to keep track of all the new members who have joined. The last member who I remember joined the group is Dr Ashit Mehta whom I met in Rajkot RA Workshop, he along with Dr Sandeep Diwan are the brain behind AORA (Academy of Regional Anaesthesia ). I used to feel bad about people not participating in discussion but I have realized that many people just like to go through the discussions and as long as they benefiting from the group discussions, we are happy. Without naming and probably offending by call them old, I would like to thank all the SENIORS on the group for their blessing and constant support. I would also like to congratulate Dr Chakrarao for being elected the President of the ISA and thank him for his association with the group. Not to forget, Dr Khan from APICARE Journal, he has been a regular on the group and support many with publications, we thank him for his association with our group. I will like to thank Dr Anil Sharma who is working hard to get the group registered as a society and in organizing the 1st meeting of the group in Delhi. The venue is already booked and once the process of registration is over we will get a bank account start the registration for the meeting. Acute herpes zoster (AHZ) or “shingles” is one of the most common neurological conditions worldwide. It occurs as a result of a reactivated varicella zoster virus (VZV) infection. Activation of latent herpes infection suggests immune-compromise state and in such cases neuraxial blocks should be avoided because of the risk of infection around the spinal cord or within the spinal canal. This case was wisely postponed. There will be situations where the surgery might be an emergency, commonly caesarean section. How do we deal with these kind of cases? If a woman acquires a primary infection with in 5 days before and 2 days after delivery her newborn is at risk for disseminated varicella infection. Women who are not immune to varicella, but are exposed may be treated with varicella-zoster immunoglobulin (VZIG). VZIG should be administered with in 96 hours of exposure. If VZIG is not available, prophylaxis can be provided by acyclovir (800 mg orally 5 times daily for 7 days). If a patient develops acute varicella, with or without prophylaxis, she should be treated with oral acyclovir or valacyclovir. If a patient develops evidence of pneumonia, encephalitis severe disseminated infection, or if she is immuno-compromised, she should be hospitalized and treated with intravenous acyclovir (10 mg/kg every 8 hours for 10 days). In order to prevent neonatal varicella, the newborn should be isolated from the mother until all her lesion crusted and dried. The infant should also be treated immediately with either VZIG or acyclovir. There is no data indicating that treatment of the mother infected with varicella will prevent congenital varicella infection. The optimal technique of anaesthesia for these patients has been the subject of debate. Regional or general anaesthesia can be used but risks and benefits of whichever technique to be used should be considered. Regional anaesthesia may introduce virus into the central nervous system resulting in meningitis or encephalitis, especially when viraemia is present. It may be safe in recurrent herpes infection because viraemia is absent. It has been suggested by some authors that use of pencil point needle may reduce the risk of introduction of viral material into the CNS and regional anaesthesia should be performed at a level where no skin lesions are present. In varicella infected patients general anaesthesia is associated with pneumonia and decrease in the immune function response postoperatively. Nitrous oxide and inhalational agents like halothane, isoflurane, sevoflurane have all been implicated. So if general anaesthesia has to be used then avoid inhalational agents by use of TIVA , opioids, muscle relaxants and 100% oxygen has been suggested. “ 27 yrs old female with average built was posted for nephrolithitomy.I inserted epidural cath at T12-L1. Activated with 3cc xylocaine with adr 2%. Then SAB at L3-4 with 3.4 cc bupivacaine 0.5% using 27G Quinke tip needle. Preloaded with 750 ml RL. Post-spinal BP remained well within normal range. (pre-op 132/78), but after 5 minutes she complained of breathlessness and soon couldnot speak...was fully awake, trying to speak but no voice..respiration became shallow. .vitals still normal..I gave her 50 mg propofol nd inserted size 3 LMA..ventilated with 100% o2..surg done in lateral position..vitals stable throughout. .respiration returned in 30 minutes..postop pt all right..resp regular afequate..voice normal..vitals normal....no epidural top done..no DP during epidural introduction ....what was this?????? CASE 2: Can 20mg of bupivacaine 0.5% produce sensory blockade upto T4 and bromage score of 1 and RAM test 0f 80% blockade only?.... 1st case of the year by me, 55/m ASA 2( HPN) diagnosed at the time of admission, Smoker 30 pack years, BMI 29, for uncomplicated appendicitis, At arrival BP 179/108, gave NTG iv and loaded with crystalloids.... inducted with BUPI heavy( sensoricaine, the best brand available here) after single paramedian puncture with g23 quincke needle... there was numbness only on sacral area in 10 mins, no motor blockade as well, at 25th mins the sensory blockade reached T4 but no motor blockade on lumbar areas and thoracic area. i told the surgeon about the situation and we agreed to proceed since it was rocky davis incision.... the operation went on smoothly without any discomfort to the patient but surgeon felt somewhat tight muscles! after 25 mins of surgery patient still bromage 1 and RAM 80%... couldnt understand what happened. I had thought that there would be a need to convert the case and was really sad as it was my 1st spinal of the new year! but all went well. Any logics explaining this? i shared this bcause i felt it was something unusual!!! ty!! Also one can look in the line of LA in subdural space : most commonly happens in Quincke needle : most of the bevel part is in subarachonoid space and small part in subdural space : During injection of LA most of the part going to Subarachonoid space and hence good block : but very very minimal amount is deposited in subdural space: LA in this space because of CAPILLARY action travelling very high and hence symptoms as described by you.Is it possible?? No haemodynamic changes but symptoms of high spinal by very minimal LA in Subdural space?? extends from below S2 to cranium.It is widest in cervical and narrowest at lumbar : Due Subdural space is a narrow potential space .It to its anatomy (have to look again for exact explanation) LA are deposited in posterior segment and spares the anterior segments of spinal cord usually where lies the sympathetic and motor control , which explains in this case. It has also variable presentation from intercostal muscle weakness , arm weakness to aphonia to cranial nerve involvement . Suspect when it is unusual in relation to dose and volume of LA : Think 3.5ml in SA and suspecting high spinal without haemodynamic changes? All 3.5ml in subdural is not possible , because you are giving after free flow of CSF. Still if you are depositing 3.5ml in Subdural , it will be failed block or inadequate block or slow onset(in subdural nerves are covered by arachonoid and pia ,whereas in SA nerves are covered by pia only) with or without inappropriate signs and symptoms like nasal stuffiness,injectate conjuctivae,aphonia, weakness of upper limbs depending upon the spread of LA : OVERALL IT IS UNPREDICTABLE:we should always keep on mind especially with Quincke. This she posted on Jan 5 and I am sure she has given lot more TAP blocks since then. Hats off to her for the enthusiasm at this age for learning. I am proud to be from the same institute as her. Primigravida with scoliosis, fetal bradycardia, BP 190/100 for emergency caesarean section, not on any medication for BP, how to proceed? I find difficult to summarise such cases as I am not a practicing obstetric anaesthetist. Depends on whether it is sustained or transient bradycardia. I'll look for signs of preeclampsia, if present, i'll start mag sulf. starting a low dose of labetalol infusion is also called for. My choice would be- Epidural with local anaesthetics, and fentanyl in subarachnoid space. Scoliosis might make it tough and USG might help show the best space. I would like to avoid GA as far as possible because airway in PIH can throw any surprises. There was not much input to this rare case from the members, probably not much experience. Thank you Dr Kumudha for sharing this case with us. Have a case next week. 30 year old achondroplastic dwarf for Lap Chole as day case. Have read all about it. Advice and suggestions please. All went well with my patient today. 51 year old lady with Achondroplasia, wt 37 kg. Previous GA for LSCS 23 years ago. No medical problems, good excercise tolerance. Good range of neck movements, Mallampatti II, full dentition with crowns on top. Starved, no history of reflux for Day case Lap Chole. We were ready for a difficult intubation. She was easy to ventilate, Grade I intubation with Rocuronium, analgesia with Fentanyl and surgeon administered bilateral TAP blocks. Very comfortable in recovery and home with Paracetamol and Ibuprofen. Prior to administration of subarachnoid block in LSCS, does anyone routinely premedicate the mother with midazolam and experienced any bad outcome of the baby? Most members were against this but on literature review Midazolam was found safe to be used. On a balance, routine use is not recommended but is special circumstances. Midazolam can be safely used in patients listed for elective LSCS. Party asked for expenditure from the hospital and surgeon but they referred back to the anaesthetist for the claim as it was considered an anaesthetic complication. In this particular case, the treatment was offered free of cost by the neuro-surgeon and the team and other cost were borne by the referring hospital after a group protest. Most important thing in such cases is documentation of the risks and appropriate management when such adverse events occur. Early interventions are associated with good outcomes. What is the cause of bradycardia and hypotension after two hours of the block? LA anaesthetics can seep to various spaces in the neck and in many cases they can travel to the sympathetic chains in the neck that not only supply the arm but also the heart ( cervico-thoracic). Sympathetic nervous system innervation to the heart is not equal to the left and right sides, and therefore the effects of stellate ganglion blocking are different as well. Efferent sympathetic nerves from the left stellate ganglion are distributed in the AV node and the myocardium (posterior to the left ventricle), while efferent sympathetic nerves from the right stellate ganglion are distributed in the SA node and the myocardium (anterior to the left ventricle). The effects of unilateral stellate ganglion block on cardiovascular control are unclear. In some individuals, the blockade of the sympathetic component occurs in predominance and this leads to unopposed parasympathetic activity that leads to bradycardia and hypotension. In this case the symptoms were probably delayed due to high inherent/ pharmacologically driven high sympathetic drive. “ She was a young 22 year old primi with mild PIH without any symptoms and normal lab parameters listed for elective LSCS. Before induction of anaesthesia HR 78/m and BP 160/90. SAB given in a sitting position at the level of L3- L4 with 27g Whitacare at 11AM. 9mg Bupivacaine heavy was used. Coloaded with 500ml of crystalloid. BP maintained at around 160-150. Level of anaesthesia before incision, around T4 to pinprick. At 11-25AM a healthy male baby was delivered. Predelivery ECG sinus HR 80 and BP 155/80. I was about to give oxytocin, but noticed agonal gasp followed by unresponsiveness. ECG, VT followed by asystole. Chest compression immediately started by me and technician advised to draw adrenaline. Was about to push the adrenaline noticed that there was return of spontaneous circulation( ROSC) with HR of 110 and BP of 170/90. ECG, sinus tachycardia. My suspicion is towards amniotic fluid embolism. Unexplained cardiac arrest, what does the forum think ? Three main D/D; AFE, BZ reflex, High SAB. This probably was a small AFE in a patient with PFO, as there was neurological even with quick recovery. PFO was proven in an ECHO that was done later. More than knowing the diagnosis, it proves again that being VIGILANT and PROMPT ACTION are important to save patients. People often become careless after RA techniques, assuming patients to be awake and stable. “ 23 yr old male, h/o head injury, brief loss of consciousness. CT scan brain shows ethmoidal bone fracture, nasal bone fracture, no other abnormality . For external fixator radius ulna compound fracture. Supra clavicular Block done By landmark technique . ( no usg and nerve stimulator available). Immediately post procedure patient complained of not feeling well. And developed focal convulsions around neck and slurring of speech. ABC instituted, pt maintaining airway, saturation 100%, given 2 mg of midazolam, not responding to deep painful stimuli. Surgery continued? 1. Even though patient was maintain the airway, it should have been secured by intubating the trachea. B. Analgesic effect of intravenous lignocaine. C.Unintentional LA migration to the subarachnoid space. This was most likely partial injection of LA into the blood vessel probably into the vertebral and the management is mostly supportive. IV Lipid is of use only in larger doses of IV LA injections but can be given safely in such cases. Swab count is done before abdominal closure and if a swab is missing you do not close the abdomen and get abdominal x-ray. If the SAB is wearing off, you might need to convert it to GA. Practice Guidelines for Preoperative Fasting and the Use of Pharmacologic Agents to Reduce the Risk of Pulmonary Aspiration: Application to Healthy Patients Undergoing Elective Procedures. Patient Information Leaflet for Upper Limb Regional Anaesthesia. 1. ROHIT GULATI: Congratulations on your new job. Rohit joined BLK memorial as consultant in Pain Management. On behalf of all the members we wish you all the best for the future. 2. MEER NOAMAN: ON 5TH JAN 2014 Meer wrote this on the group. We are proud of you Meer and thank you for sharing your success with us. 3. SENTHIL KUMAR MUTHU: Establishing Regional Anaesthesia Service for Upper Limb Surgery - Our experience to share.